We all know there are a couple elements necessary for a successful Halloween costume: the cute and the comfy. But there's the clever and the authentic, the bizarre and the naughty, too. There's probably even more than that, but it's been a long day, and we hope you can agree with at least this much. How many of those boxes could you check off when your little one sports this adorable polka dot costume? The cuteness is inherent, so the naughty, clever, and bizarre, we guess, are left up to you and your little princess to add. Hit a couple of those marks and, who knows, she could be the life of the costume party or the light of a dark trick-or-treating jaunt. Next to a bunch of spooky ghosts, she might somehow look even cuter than before. At the doorstep of your neighbors' place, she'll be a sight for sore eyes currently reeling at the horde of zombies out and about. 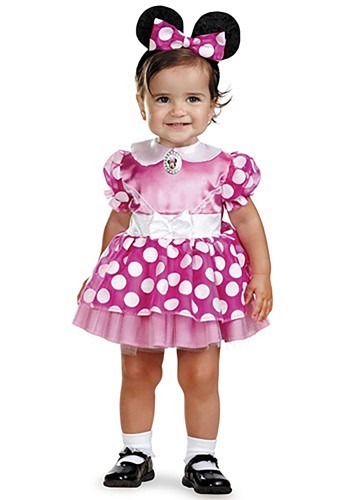 This Infant Pink Minnie Mouse Costume—complete with lace trim, a three-layer satin skirt, and a glittery mouse-ears headband—is as much a treat for her as it is for everyone around! Pair the white satin waist sash and peter pan collar with some black leggings and dark, shiny shoes to start a classic adventure your little mousie will never forget!